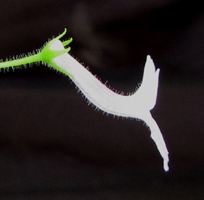 The pictures show a side view of the flowers of the three smallest sinningia species. From the left: Sinningia pusilla, Sinningia concinna, and Sinningia muscicola. 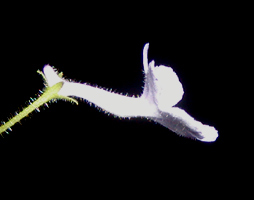 Note the characteristic "spur" on the S. pusilla flower on the left: the base of the corolla tube extends back beyond the upper calyx lobe, bending it backwards, while all five calyx lobes of the S. concinna and S. muscicola flowers project forward. This difference between S. pusilla and S. concinna can be used to distinguish hybrids that involve one but not the other. For instance, Dale Martens's S. 'Heartland's Flashlight' has the spur, showing that it is descended from S. pusilla (in fact, it is S. pusilla x helioana). 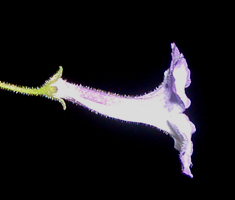 A related characteristic is the angle between the pedicel and the corolla tube. The pedicel and corolla tube of S. concinna (in the middle) are essentially in a line, while the pedicels of S. pusilla and S. muscicola make an angle of about 120 degrees with the corolla tube. The distinguishing feature of S. muscicola in these profile views is the bend in the tube, particularly the top line of the corolla. S. muscicola has a characteristic bend in the middle of the corolla, while the other two species have corolla tubes which are straight on top and almost straight on the bottom. Note that the colors in these three photographs cannot be trusted. All the flowers are more purple than shown, particularly that on the right (S. muscicola). Leaves Leaf blades are heart-shaped, about 1.5 cm wide and long, dark green with dark red veins. From the side they look flat. The petioles are longer than the blades. Leaf blades are oval, pointed, about 2 cm long and 1.5 cm wide, dark green with dark red veins, but the veins are not as prominent as those of S. concinna, and the veins, particularly the midvein, are depressed into the surface of the leaf. Leaves spearpoint-shaped, twice as long as wide, dark green with dark red veins, the dark color extending into the regions between the veins on both sides of leaf. Margins prominently serrated. Leaves are hairier than those of the other two species. Leaf arrangement Rosette Decussate. Decussate. Flower attachment Pedicel joins base of flower. Pedicel is roughly parallel to corolla tube. Base of corolla tube (spur) extends 2 mm beyond point of attachment. Pedicel makes angle of 120 degrees with tube. Pedicel joins base of flower. Flower shape The tube is very close to straight, with the lobes spreading almost at right angles to the tube. Tube is slightly bent upward about 1 cm from the base. The lower lobes project forward. Tube is bent upward at an angle of about 30 degrees, about 8 mm from the base. The lower lobes project forward like those of S. pusilla. Flower color Top two lobes are purple, lower three are white bordered with purple. Top of corolla tube is purple, sides are white, bottom is speckled purple, both inside and outside. Tube is mostly white, with a flush of purple on top. Lobes are lavender, with darker purple areas close to the junction with the tube. (Variety 'White Sprite' has white corollas.) Tube is almost white, with faint lavender stripes down the middle of the lobes, very faint in the case of the lower lobe. Outside of the tube is lavender.